In our previous blog series of GST new return formats, we have covered the aspects of introductory part giving brief idea about the simplified formats, new return formats for Large tax payers and comparative analysis of GSTR-1 and proposed tax returns for Large Taxpayers. Our recent blog states all the differences in GSTR-1 parameters however, this blog focuses on “Small taxpayers” and how return filing will be shaping in the new return formats scenario. Taxpayers who have a turnover up-to Rs.5 Cr. in the last financial year shall be considered small Taxpayer. These small taxpayers shall have facility to file quarterly return with monthly payment of taxes on self-declaration basis. However, the facility would be optional and small taxpayer can also file monthly return like a large taxpayer. Point to note is that a newly registered taxpayer shall be classified on the basis of self-declaration of the estimated turnover. Though in existing scenario, there is no terminology-based bifurcation, the Turn-over bifurcates the tax-payers into different category. In forth coming GST return regime, the tax-payers are bifurcated as Small and Large based on turn-over. In this blog let’s understand about changes as per the new return process for Small Taxpayers. Tax-payers with turnover not exceeding Rs.1.5 Cr during preceding financial year have an option to file ‘Quarterly return’. Tax-payers with turnover not exceeding Rs.5 Cr during preceding financial year are termed as Small Tax-payers and have an option to file ‘Quarterly return’. Return format for Quarterly filers is same as that for Monthly filers. If “Quarterly Filing” is opted, the upload of Outward Invoices is done on Quarterly basis in Quarterly filed GSTR-1. A facility to continuously upload invoices in the normal course would be available. The invoices uploaded by 10th of the following month would be available as input tax credit to the recipient in the next month and in the case of purchases from large taxpayers. Taxes are paid monthly by way of GSTR-3B. 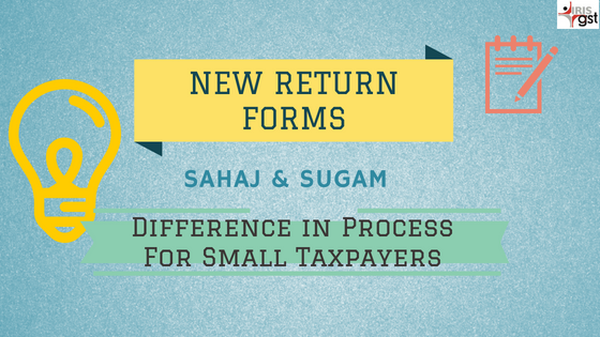 Sahaj & Sugam are two different pre-defined return types. Small tax-payers, opting for Quarterly filings, have an additional option to opt for appropriate pre-defined options from amongst Sahaj and Sugam. Currently there is no provision for such actionable invoices as GSTR-2 is suspended indefinitely. Self-declaration in GSTR-3B and if purchases are made from B2B dealers, then on the basis of such invoices as appearing in GSTR-2A. Since there will be continuous uploading facility, similar viewing facility of uploaded invoices will also be there to facilitate calculation and appropriate claiming of ITC. Late fees at Rs.25/- for each day of delay under CGST and SGST respectively and Rs.50/- for each day of delay under IGST shall be attracted. Minimum of 4 digits HSN code is mandatory for turnover not exceeding Rs.5Cr. The GST implementation and the initial compliance made the registered dealers to bear high cost to set up the infra-structure or to decide not register themselves. The later resulted in loss of business as large-tax payers hesitate to deal with unregistered dealers. Since the regular uploading of invoice is made available, the ITC and business won’t be hampered. Also, since currently the infrastructure is set and the compliance has been made flexible through Sahaj and Sugam forms and Payment forms, the return compliance has be relaxed. What are “Sahaj” and “Sugam” Returns? Small taxpayers often have purchases only from the domestic market and sales in the domestic market i.e B2B purchases locally and supplies either as B2C or B2B+B2C. They constitute a very large part of the tax base and therefore two simplified quarterly returns are proposed for them respectively. They have been named as “Sahaj” (only B2C outward supplies) and “Sugam” (both B2B and B2C outward supplies). In effect, these returns are pre-determined profiles for small taxpayers using quarterly return. In our subsequent blog, we will be covering a Comparative analysis of Quarterly return, Sahaj and Sugam. IRIS Business is a leading GST Suvidha Provider (GSP) and provides easy and efficient solutions for GST and E-way bill compliance. For further details, please write to support@irisgst.com or visit our site https://irisgst.com. thankyou so much for sharing this useful information on the simplified return filing of GST. this article is really helpful.